All Oregon - Oregon Directory of Oregon web sites by someone actually born in Oregon. The only Oregon directory created by a fifth generation Oregonian. There are thousands of links to Oregon based web sites on the All Oregon Directory. This is the only Oregon Directory on the internet owned by a fifth generation Oregonian who has traveled to every corner of this beautiful state. Let me share Oregon with you. From the Oregon coast to the high deserts east of Bend Oregon, the state is full of surprises. Salem is our capital and Portland Oregon is our largest city. Eugene Oregon is the home of the University of Oregon Ducks and forty-five miles north, Corvallis is the home of the Oregon State University Beavers. This directory was created to bring you travel, business, recreation, real estate, maps and employment information about Oregon. The links below will take you to pages that list the cities for each region. 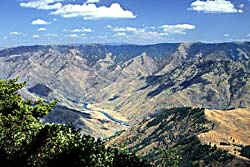 You will find travel, Oregon real estate, business and general information. Check out the state of Oregon links to great products, services and travel on the left.